When people talk about Belgium, they of course talk about good food, champion road cyclists and the Flemish masters of the 15th and 16th century, but also… beer! In Belgium, there are about 400 kinds of beer, an enormous variety for such a small country. Therefore, we couldn't wait to create a tour with Belgian beer as the central theme. Enjoy cycling through authentic Flanders, but especially the breaks in cosy cafés, with a refreshing beer! Tonight you will be staying in Mechelen. A walk in Mechelen city at the river Dijle will show you all the most important historical buildings which were erected in the time of the Burgundians. Mechelen was one of the main political centres of the low countries during the 16th century and has over 300 historic and protected buildings its glorious past! Highlights to visit include the St. Rombouts-cathedral, which gives a superb view of the surrounding region, the palaces of Margarete of York and Margarete of Austria, the market square and the beguinage. 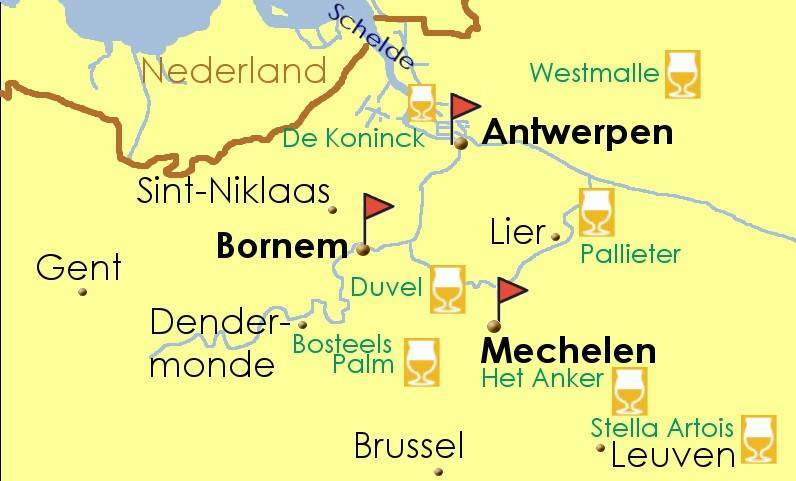 The most famous beers in Mechelen are the 'Maneblusser' and the 'Gouden Carolus'. These beers are produced in the brewery 'Het Anker', definitely a stopping point to note down! We leave Mechelen along the green borders of the wiggling river 'Nete' to the town of Lier. Lier is known in Belgium as the 'Pallieterstad'. Pallieter is the key person in the Flemish novel 'Pallieter' from the writer Felix Timmermans, who was born in Lier. This character enjoys life like no other, and that is exactly what you can do in Lier: take a rest in a local pub and enjoy the local beers like 'de strooien hoed'or the famous cake 'Liers vlaaike'. There are also ther great sights including the beguinage, the 'Zimmertoren' and the market square. After Lier, we cycle further to the famous town of Antwerp, also named 'koekenstad' (biscuit town). Along the tour to Antwerp you will see some fortifications from the First World War. Today we will discover Trappist beer! The route brings us through the green landscape of the 'Kempen' region to the famous Westmalle abbey. The abbey was founded in 1794 by French monks seeking refuge from France. The Bishop from Antwerp gave them a farm so that they could earn a living and they started brewing the Westmalle beer around 1850. The abbey itself cannot be visited but there is a pub near the abbey where you can taste the superb Trappist Westmalle beer and the local traditionally produced cheese. Today we will discover the historic town centre of the artists' city of Antwerp and its surroundings. Visit the famous brewery and beer museum (included as part of your holiday!). Enjoy the beer tasting at the brewery! Antwerp has one of the largest harbours in Europe, and is also the home town of the painter Rubens, fashion houses and jewellery shops. Antwerp is a multi-faceted city where tradition and modernity go hand in hand! Most buildings in the historic town centre date back to the 16th and 17th century. There are many museums (like the MAS, museum aan de stroom) and monuments to be visited. The town hall and the central station are perfect examples of the beauty and variety in the architecture of Antwerp. If you want to go shopping, you can stop by the Nationalestraat and in the Meir! From Antwerp, we go along the Schelde river to Bornem. When you have left the centre of Antwerp you can admire the landscape of the 'Hobokense Polder' a surprisingly tranquil area so close to the centre of a major city! On the road to Bornem you can visit the abbey of Hemiksem. You will also pass the brewery 'Bosteels' where they brew the famous 'Karmeliet', 'Kwak' and 'Malheur'. Today we go back to Mechelen where we started the tour. On the ride through the authentic flat Flemish landschape, you will pass the 'Palm' brewery in Steenhuffel and the brewery of the very famous beer 'Duvel' in Puurs. For those who want to learn more about brewing techniques, or exactly have to serve a Duvel, it is essential to visit the Duvel brewery! You can also have a break in cafe 'den Triest' in Kapelle op den Bos! Today we will visit another art city, and also the 'beer capital' of Belgium: Leuven. Around this city, there are 5 breweries that produce a wide range of notable beers. The Stella Artois brewery is the biggest brewery in Europe! It is said that the biggest bars in the world can be found in Leuven. Leuven also has the oldest university in the low countries, established in 1425. Leuven is not only known for its beer, it is also a city with treasures like the beguinage and the exceptional gothic town hall. After this splendid tour, we are back in Mechelen for the last night of our tour. Departure or extend your holiday! The routes are flat and easy on well signposted and well maintained routes. Cycling is a very common mode of transport in Belgium and locals are accommodating of cyclists. We recommend flying to Brussels Zaventum or Brussels Charleroi airport to reach the starting point of this cycling holiday. The Belgian Beer Trail cycling holiday includes the daily transfer of luggage to the next hotel and local support if required. You will receive an accessories package including a bicycle pannier bag with a good capacity, repair kit, lock, key, and air pump. When you make a booking with us, we take your height(s) and the appropriate bike size is matched up accordingly.